In aiming to optimize democratic policy making we need to realize that our rationality as human beings is not perfect, our training and our professional experience are limited to specific areas. These observations are also valid for our leaders. Also a randomly composed group of people will often not have the perfect solution for a problem. They might assess the situation wrong, miss out on one or the other relevant aspect, they might forget one or the other element in designing problem solutions, which leads to their ineffectiveness or even failure. Management Science has developed problem structuring methods which guide our thinking and help us to make sure our problem solutions are adequate and effective in a given situation. The approach we suggest in this blog to use for “optimizing our democratic policy making systems” is based on Systems Thinking. Below I include a description of the method contained in an article I wrote with the title: “Enhancing the effectiveness of international development – a systems approach”, published in Development in Practice, Routledge, 04/2010. The reader will find details on the two books quoted in the text under the “Library” tag in the blog. Systems Thinking, in particular the Contingency Theory or the “functional approach” within Systems Thinking, understands “systems of purposeful human interaction”, be it in business or public policy, to operate in a way similar to systems in biology, such as the human body. According to Systems Thinking the elements or sub-systems, which systems in business or public policy need to contain in order to function effectively, are determined by the purpose the systems want to achieve. Key sub-systems for the functioning of the overall systems are communication and control. Systems and their sub-systems are interdependent and organized in hierarchies; people in companies for example are parts of workgroups, which are part of departments, the departments being part of the company, and the company itself being part of a wider social system (Ulrich and Probst 1991). 1. Goal review and definition. 2. Compilation of all parameters affecting the defined goal or goals. 3. Observation of how the system and its elements behave without interference. 4. Clarification of the possibilities for intervention. 5. Determination of strategies for problem solving which address all parameters of relevance. 7. Evaluation of resulting situation and restart of process, if required. They emphasise that getting the goals of a system right is of the highest relevance for the effectiveness of a system. In order to enhance the quality of the analysis, the authors recommend bringing in specialists from various disciplines to jointly analyse the relevant parameters for achieving these goals. Systems are, however, not only the organizations and processes created to fulfil certain aims. Checkland points out that systems, viewed in a wider perspective, also comprise the “actors”, those system elements who “operate” a system, the “customers” of a process (who may be “beneficiaries” or “victims”), and the “process owners” (those with the power to stop it, in the words of Checkland; in this paper we understand the “owners” also as those who initiate and drive a process) (Checkland 2001). The sections on how to optimize democratic policy making in this blog and the proposal for the sequence of steps required for optimizing our democratic policy making system will be based on these concepts. They help us to define what kind of system democratic policy making is. Since systems “of social interaction” are defined by their goals, we suggest understanding policy making as a “system to manage public policy issues in such a manner that well-being of society as a whole is maximised”. But as we see already this proposal implies many questions which need to be discussed and clarified in society, such as the questions, how we define “public policy issues” or which role the well-being of minorities plays with respect to the general goal of maximizing the well-being of society. One advantage of the proposed process is that it forces us to identify and address each relevant question and issue in a systematic manner. A key suggestion made in the approach is to involve people with different perspectives in the design of a problem solution. We suggest that at least some should have training in management and problem solving methodologies. As we point out in another section of this blog, our chances to arrive at the best systems and processes for optimizing the performance of the democratic policy making systems are the higher, the more perspectives we include. A question of relevance in optimizing democracy is of course the critical issue raised by Checkland, who the “process owners” are, a question of particular relevance in the United States for example, where big money plays a major role in determining the outcome of elections and all too often perhaps also policy decisions. The challenge is to find a solution geared to optimizing democracy in which wider civil society determines the precise goals and operations of the policy making system. The solution we suggest in this blog is a citizens’ initiative or association to “set the operational standards” for the policy making system. This entry was posted in Process and Model on February 13, 2013 by hpulrich. Whichever way we may be aiming to contribute to improving policy making, be it by wanting to influence an individual policy area only or by improving the overall policy making system, given the size of the policy machines in democratic countries we must maximize the effectiveness of our own action, if we want to have any success. The graph Optimizing Democracy – The Sequence of Steps describes how making a contribution of such a quality should be possible. Presently there are many movements for better policy making in various countries: Better government initiatives, movements for direct democracy, initiatives to enhance transparency in policy making etc. Competition and independence of thinking is necessary to allow the best ideas to come forward. But in order to move ahead effectively, agreeing on a plan and combining energy around its implementation is required. Any plan to make democracy better necessitates the approval of and legitimation by wider society anyway. If the initiatives to make public policy better cannot agree on the “best plan” to move forward, how should society then be able to support a particular concept? Initiatives working for an improvement of democratic policy making should jointly aim to present the best plan to wider society. This does not mean they should agree on the handling of concrete individual policy issues, but simply on the concept for generating the most effective policy making structures and processes. Deciding on an effective way forward requires agreeing on a specific goal in the wider scope of “enhancing the quality of policy making”. Some people concerned about the state of our democratic countries propose concentrating on urgent individual policy issues, such as employment and social stability only. But what about global warming, the most severe threat for humanity as others suggest? How can we establish with greater certainty how large the threat truly is and what we must do concretely to fend it off? What also about health, about establishing international peace and understanding and avoiding further unnecessary deaths in lingering or new international conflicts? If we succeed in reducing unemployment at the present time, global warming might shatter any advancement in the well-being of society based on such success completely in the next twenty years or so, if we neglect doing something about it. Given this interdependence of policy issues we suggest a comprehensive approach to making our policy making systems better. In the light of the relevance of our policy systems for our countries and in fact the management of the entire globe, we suggest not to settle for “improvement” as a goal but for “optimization”. As also mentioned in the graph, aiming now for setting up the best democratic policy making structures and processes will furthermore contribute to maintaining the best quality of policy making in the future. This might become important, if let us say in ten or twenty years from now, discontent with established parties were to increase to such an extent that more extreme parties came to power. To have mechanisms which even in such a scenario were to contribute to sound policy making would not be bad. Once we have agreed on a specific goal, the graph suggests as a next step to analyze the parameters affecting the achievement of this particular goal achievement. It should be useful to insert at this point that the suggested steps here are a rudimentary application of a systemic problem solving methodology suggested by Hans Ulrich and Gilbert Probst in their book “Anleitung zum Ganzheitlichen Denken und Handeln” (Translates roughly to: “Guide To Interconnected Thinking and Action”), Haupt publishers, Berne 1991, a book which unfortunately does not appear to have been published in the English language so far. The key factor of relevance for the quality of our democratic system as a whole will be the effectiveness of each individual step in the process of policy making, from identifying public policy issues, to prioritizing them, determining the best ways to tackle them, and attributing the required public resources to the solution of each policy issue. A rather intense debate on the role of the state has been led in the United States for some time. Many people demand the government’s “downsizing”. 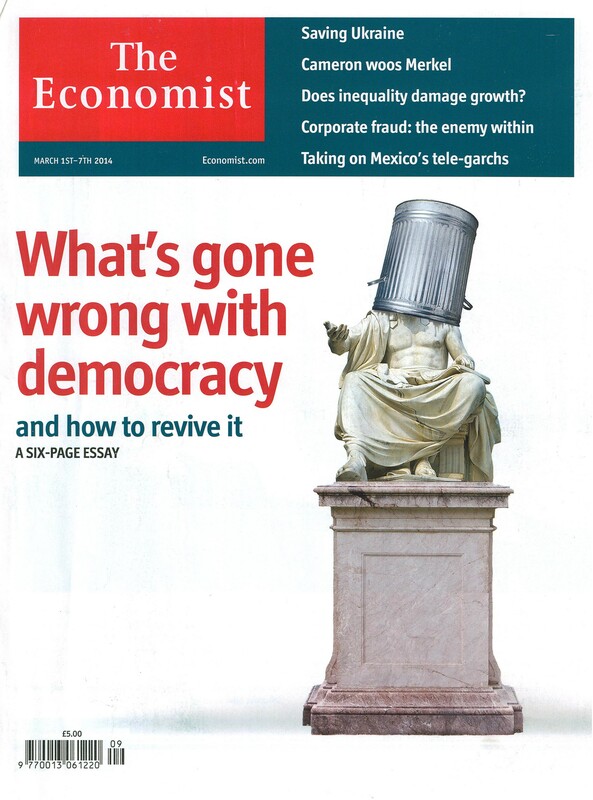 What democracies should have is a highly effective system to define the tasks of the state. • The adequacy of resources to allow each system to achieve its purpose. • The quality of control over each system. In order to optimize democratic policy making, the initiative would have to ensure that those parameters are in place and optimized for each individual step in the policy making process itself, and also for each policy area. Systems thinkers suggest rightly that also communication between system, sub-systems, and stakeholders is of relevance for its output. We propose here that effective control will also take care of setting up effective communication systems and processes. Control as the key parameter for success will also ensure that the other four factors mentioned are in place. It will ensure that policy makers and civil service employees have the optimal qualifications for their tasks, it will identify the best processes to check that both, politicians and civil service employees work only for the common good, beyond a fair salary, rather than for their own interests. It will arrange for an optimal match between the goals and tasks of public policy and the available resources. In another part of this blog we emphasized the importance of know-how next to control. The first know-how element of importance is how to set up an effective control system over policy making as a whole. Once this know-how and an effective overall control system is established, this top level control system should set up a system to establish the optimal know-how for all detailed elements of the entire policy making process. As we also pointed out the support of wider society is required for establishing the optimal know-how for all of these processes. An initiative which goes through all of the steps suggested exerts control over the policy making system. In the course of its work the initiative will realize that the aim must be to constantly ensure the optimal operation of the democratic policy making system. It becomes clear that a permanent citizens’ organization needs to be established to take on this responsibility. Last not least an initiative to optimize our democratic policy making systems would also have to examine the proposals made here. This entry was posted in Process and Model and tagged Democracy, Discontent with Democracy, Global Warming, Governance, Participation, Public Policy, Unemployment on December 14, 2012 by hpulrich.